I am delighted to welcome Michael Wood as a guest blogger on Jolly Quaker. Michael has around eight years experience of Quaker youth work, and is currently co-ordinator of Friends Southern Summer Events (FSSE) Junior Gathering and Clerk of London Link Group. All views expressed here are Michael’s own, and not necessarily those of FSSE and London Link. From the moment I was a gurgling baby in Meeting for Worship, I had a really good experience growing up as a Quaker. An interesting children’s group, a great teenage group and link group (regional gatherings of young people), as well as camps, FSSE Senior conference and Summer school, were all available to me. I started helping out with Quaker young people’s events to make sure all this continues. In the various ways I’m involved in Quaker youth work, I am starting to sense that British Quakers are losing their corporate knowledge on how to include children and young people in their Meetings. In this post, I want to bring attention to some things that may help to address this. How do we welcome children, young people and parents in the first place? People will look up information about the Meeting they are planning to attend via the web, the ‘Find a Meeting’ feature on the Britain Yearly Meeting website provides the basic address and contact details. It also gives information on ‘Children’s provision’, as stated by the Meetings themselves. I wonder how many of these statements come across as welcoming? Nearly half of the Meetings I looked at (51 out of 111) ask to be contacted before bringing children to Meeting. Other examples include: ‘Children’s meeting by arrangement. No young people’s meeting‘, ‘No children’s meeting but provision can be made if required’, ‘We can cater for children if notified’, ‘Children’s meetings are arranged on a very flexible basis…’, ‘Children welcomed and can be entertained with drawing and reading materials, but must remain the responsibility of the adults who bring them.’ The list goes on. I hope that the intent for all Meetings is to be as welcoming as possible regardless of age. What does your Meeting say to inquisitive parents? Does it need fixing? If there is no current need for a young people’s or children’s Meeting, then being prepared is the key to being welcoming. How many people in your Meeting are DBS checked? How many should be DBS checked? If you don’t know what a DBS check is, then find out! Have you read an issue of ‘Journeys in the Spirit’? Where do you keep you emergency children’s Meeting plans and supplies? Are your plans thought provoking and fun? What youth groups, link groups and summer events are available to young Quakers in your Local Meeting? cypadmin@quaker.org.uk can put you in touch with them. 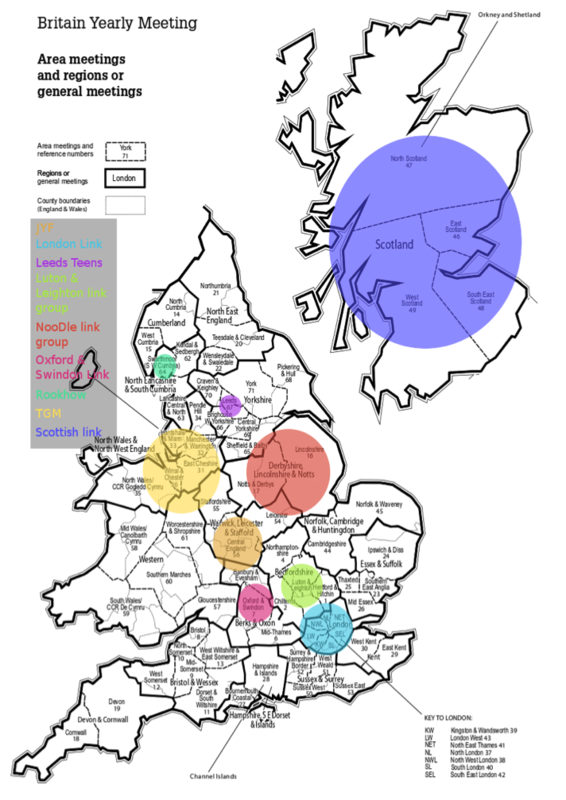 Is your Area Meeting affiliated with a Link Group? I roughly (and generously) count about 40 out of 71 (56%) Area Meetings that appear to have no affiliation with a Link/Youth group. We need more! There are currently six summer residential events offered in Britain. There is fair coverage of these geographically and all report being open to applications from outside their primary catchment areas. These events are generally a week long. That extra time together is what creates such a unique community. Many young people cite it as the highlight of their year, and the friendships made at these events are often ones that outlast others. When school, university and jobs all change, these are the friends that stay. Often these events have a theme, allowing young people to explore the issues that are most important to them. The atmosphere at these events mirrors what we as Quakers would wish for all of society – truth, acceptance, love and joy. As one FSSE participant said, ‘At Senior Conference you feel accepted for who you really are. The community which is built in just one week is amazing and makes you feel very comfortable.’ How can we make this experience available to more and more young people? We are all at different stages on our individual spiritual paths, but we sometimes forget that the distance we’ve travelled isn’t related to how long we’ve been travelling. Physical age and spiritual maturity don’t necessarily go hand in hand! Our responsibility to help each other on our spiritual journey extends to children and young people. We need to make sure we provide a safe space for this to happen, to explore our values and truths, to find out and take up opportunities to live our faith and to learn about Quakerism through each others experiences of it. We can afford to be more confident about our message to young people, because Quakers in Britain are pretty cool, even those ones who wear socks and sandals. We can be radical and progressive, we listen, and our identity comes from trying to live our values irrespective of popular opinion, the government or any other power which would have us do otherwise. Young Quakers aren’t the future of Quakerism, they’re the present. Young Quakers should not be labelled (and therefore dismissed) as belonging to a future age and therefore different from the rest of the Meeting. If we as Friends want to avoid an ever growing age and understanding gap, we have to start with our own Meetings and the attitudes we have towards children and young people. How does Michael’s experience of children and young people’s work amongst British Quakers chime with your own? When have you seen children and young people fully included in the life of your faith community? When have you seen them shut out? Fantastic Blog! Please share widely! You’ve moved me to action: I’m going to go check our website and see how we welcome families. Many thanks for sharing. – Leeds Teenage Meeting Every third Sunday in the month Ages 11 to 18 from Leeds. – Luton & Leighton AM Link Group Ages 11 to 18 from Luton & Leighton Area Meeting and surrounding areas, although others welcome. – Oxford & Swindon Link Group Ages 12 to 18 from Oxford & Swindon Area Meeting. – Rookhow Residential Weekends Ages 11 to 18. – Teenage General Meeting (North West) Ages 13 to 18 from north west of England and North Wales. Glad to hear someone else saying this stuff! A twisted version of ‘families are welcome but…’ is ‘it’s so good to see some young faces here!’. It carries the same implication – that the presence of young people is abnormal. In fact, a Friend at an Area Meeting once said to me, “Normal young people don’t come to Area Meetings, do they?” I had to be quite secure in my faith and my commitment to the business process to go back to another AM after that. The ‘it’s so good to see young people!’ was a running joke when I was at YFGM. I presume it still is. George Fox was 19 when he began his ministry! I know of younger London-based Friends whose efforts to get to Area Meeting have been frustrated by AMs starting at times no one with a job in the City could ever get to on time. That ‘normal young people’ comment takes the biscuit! a) a spiritual problem with “children” whose Quakerism, while lived and profound, is radically different from that of their meeting, or even Quakers in general. When they try to share, they get eldered, both in person and on social media. b) If your meeting consists predominantly of people new to Quakerism, exploring their journey, many of whom have come because they think we are all liberal Christians, they may be taken aback by the views of a “cradle” Quaker who is, in effect, an atheist for example. Especially if the cradle Quaker “elders” them (it has happened) about why this is so and the older person is not used to the independent voice of a young person. c) How do “children” who are used to taking care of themselves and coming and going independently deal with a meeting which wishes to nanny them, especially if the “children” wish to come without their parents to act as intermediaries. Many meetings do not seem to be able to cope with children coming on their own, which is a problem if their parents no longer wish to go to meeting. d) “I don’t go to meeting to sit in a hut with kids who don’t want to be there”. Young Quakers may not be interested in what Friends have to say to them and some “young Quakers” are quite depressing to be around, (and I say that as a mother), because they are not used to being enthusiastic about anything. Give the Quaker Life Children and Young People’s staff team a call. We might be able to help. P.S. Great post though and very grateful for the work Michael Wood does for our children. Keeps them in Quakers in spite of all these issues. In Friendship. close to my heart and action – thank you, Michael. This Sunday is our all age Meeting outing and about to go to Luton and Leighton AM camp, with LOADS of new families. Sunday 1030-1130 is not the mainspring for children and young people’s involvement. Our meeting has a good children and young people’s meeting once a month. Some of our children sit in main meeting on other weeks. My desire for our meeting is that we are ready for children every Sunday, including those for whom it is too difficult to sit through a whole hour of meeting for worship. It has been national and regional young Quaker events that has kept my 3 children involved with Quakers and I thank people like Michael. If we are not welcoming children we are not welcoming families and therefore not welcoming parents. Three weeks and 3 days before I stop being Quaker Life Children’s Work Officer so just a few more chances to say things. Thank you for this piece – it reflects our ongoing concerns for and advocacy of the place of children in Quaker meetings. If Quaker meetings are thinking/worrying/struggling with what to to do about or how to start provision for children – a children’s meeting – then two of the best places to start are with these Quaker Life resources: ‘Being ready for children in your Quaker meeting’ and ‘What about the children in our meeting – exploring the purposes of Quaker children’s work’. They can both be found and downloaded at:can be found at: http://www.quaker.org.uk/working-children-0-12-years-0 . This page also has links to all sorts of other resources for working with children in a Quaker setting. Thank you so very much for all your contributions to things children and Quaker. I’ve learned loads from you. All the very best and wishing you exciting new adventures. This will be the end of what has been an exciting and innovating era. Really sorry to see you leave but after 30 years in the same job, it’s understandable you need a change! All the best with Godly Play.